This Corned Beef Hash and Eggs is filled with tender potatoes, chunks of corned beef, green peppers, and spices. It’s topped with eggs and a sprinkling of cheese, and then baked to perfection. If you’re looking for a zesty breakfast or brunch option, then you’ll love this flavorful skillet! The first time I made corned beef, I spent about an hour trimming the fat off before I placed it into the slow cooker. I was almost in tears of frustration because it took so long to do…and I vowed never to make corned beef again. Until the following year, that is. But, I became wiser the next time. I just plopped the corned beef right in the slow cooker, without removing the fat. And you know what? It just flaked away just by using a fork once it was ready. If you’ve never made a corned beef before, then you probably don’t know what I’m talking about. But if you have, then maybe the layer of fat on the hunk of meat frustrates you, too. And now that St. Patrick’s Day is just around the corner, I’m getting a taste for corned beef again. And this time, I thought I’d switch it up and make a breakfast dish. And go the easier route. After all, I’m all about the easy recipes! 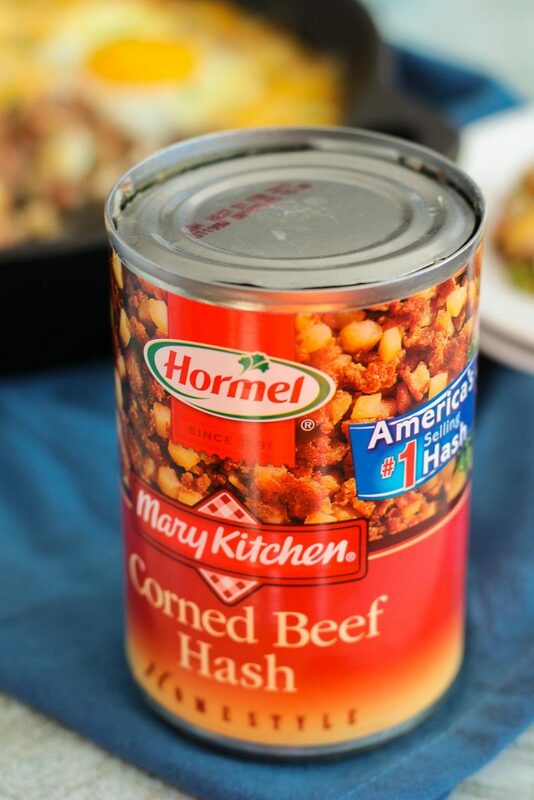 After shopping at Walmart a few weeks ago, I stumbled across HORMEL® MARY KITCHEN® Corned Beef Hash. Since I knew this would be the start ingredient of my breakfast, I decided to stock up on a few cans. It’s a convenient way to treat yourself to “special occasion” breakfast or brunch that you might not have every day. 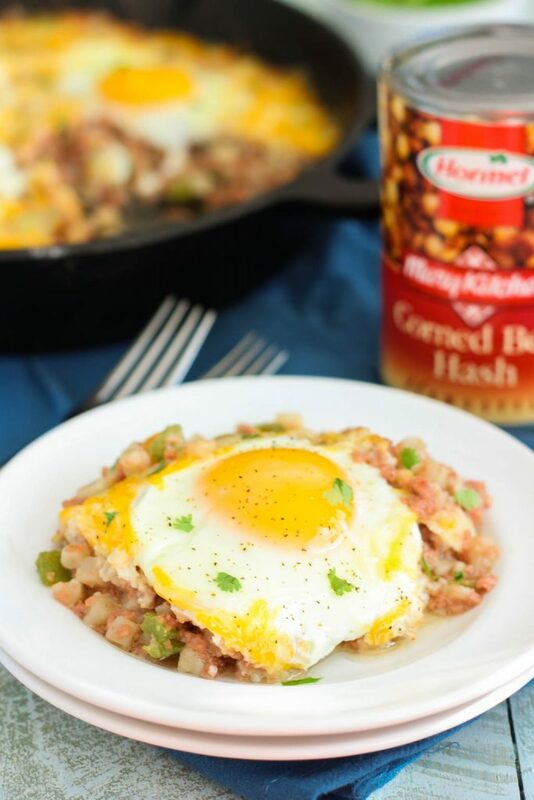 By featuring quality ingredients that are flavorful and hearty, you can skip the time consuming process of preparing corned beef and whip up and easy and delicious dish by using HORMEL® MARY KITCHEN® Corned Beef Hash. And that’s exactly what I decided to do. Since I could eat breakfast for pretty much every meal of the day, I decided to make this Corned Beef Hash and Eggs for the hubster and I. It serves as a delicious “brinner” or breakfast or dinner! Or, of course, for breakfast or brunch, too. Like most of my recipes, this skillet is a breeze to whip up! From start to finish, you can have this dish prepped, baked and ready to be devoured in about 30 minutes. How about that for a delicious breakfast? And if you’re anything like me, you’ll be eating this skillet for breakfast, lunch and dinner…it’s just that good! To start, you’ll sauté a diced, green pepper in a cast iron skillet. Once the pepper is tender, add in the HORMEL® MARY KITCHEN® Corned Beef Hash and some seasonings. Gently stir to combine. Next, you’ll top the hash with four eggs and a sprinkling of cheese. I used a blend of shredded cheddar and mozzarella cheese, but feel free to use whatever you have on hand. Pop the skillet into the oven and bake until the eggs are set and the cheese is melted. Top with some salt, pepper, and parsley, if desired, and dig in! 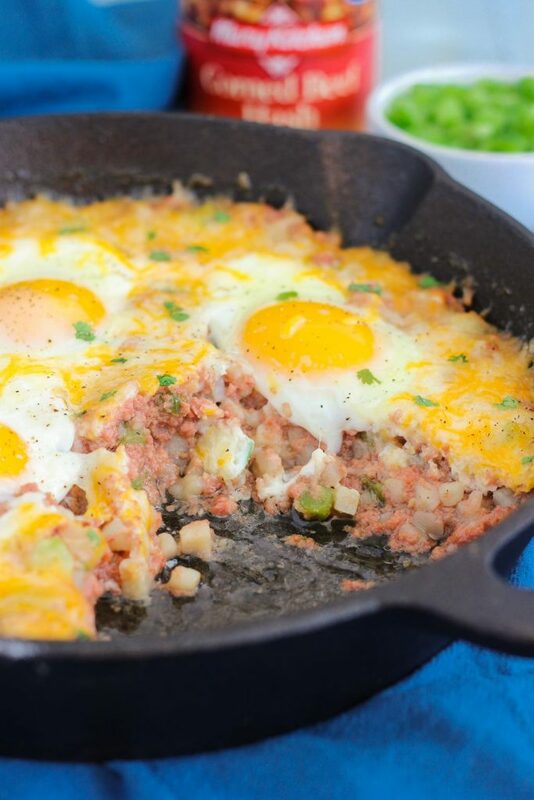 One bite and you’ll be hooked on the delicious taste of this Corned Beef Hash and Eggs. The potatoes and corned beef and seasoned to perfection, while the eggs and cheese provide the finishing touch. If you’re looking for that perfect, St. Patrick’s Day dish, or just want a special breakfast to prepare, then I guarantee you’ll love this skillet, flavored with HORMEL® MARY KITCHEN® Corned Beef Hash! This Corned Beef Hash and Eggs is filled with tender potatoes, chunks of corned beef, green peppers, and spices. 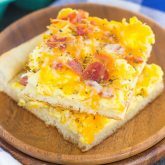 It's topped with eggs and a sprinkling of cheese, and then baked to perfection. If you're looking for a zesty breakfast or brunch option, then you'll love this flavorful skillet! Heat olive oil over medium heat in a cast iron skillet or regular skillet. Add green pepper and sauté until tender, about 4-5 minutes. Add the HORMEL® MARY KITCHEN® Corned Beef Hash, garlic powder, salt, and pepper. Stir to combine. Heat over low heat for about 1-2 minutes. Crack eggs on top of hash, in an even layer. Bake for 18-20 minutes, or until eggs are set to your liking and cheese is melted. Remove from oven and top with additional salt, pepper and parsley, if desired. Like what you see? 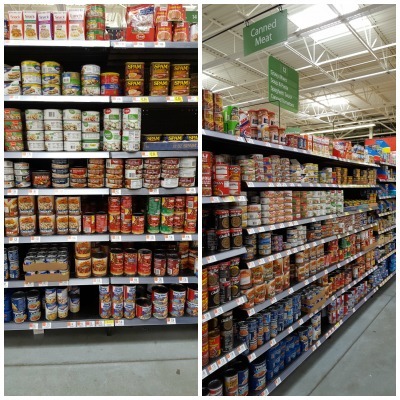 Then be sure to head over to your nearest Walmart to check out their collection of HORMEL® MARY KITCHEN® Hash. You can also save $1.00 on the purchase of any two (2) HORMEL® MARY KITCHEN® Hash products by using this coupon from Hormel. I love making corned beef in the slow cooker. It pretty much just cooks itself! This hash looks pretty amazing. Just in time for the big holiday! Corned beef in the slow cooker is the best! I didn't make this hash in there, though. Much easier using the oven! They are some perfect looking eggs Gayle! I just want to cut in to them to see the yolk :) A delicious filling breakfast. Aren't runny yolks the best? Thanks, Dannii! Thanks for the breakfast love, Catherine! I technically cheated the first time I made corned beef... since it was in culinary school, I had a seasoned professional showing me the ropes. From that day on I have been addicted to homemade corned beef. Never tried the stuff in a can, but I am loving how easy it is!! And your hash and eggs looks delicious! Breakfast of champions going on here! I'll take the whole skillet please! Pinned! Cheers, Gayle! Sounds like you're a pro at cooking corned beef, Cheyanne! This was my first time trying the canned kind, and I have to say that I'm impressed! it definitely makes a delicious breakfast. Thanks for the kind words and pin, friend! Thanks, Kate! I think you would love the eggs and hash combo. So perfect for breakfast! Hearty, delicious, and setting off my crave-o-meter! A classic dish with all of the good stuff! I could eat this for breakfast or dinner. So good! Breakfast for dinner is the best! Thanks, Ashley! So glad you made corned beef again after that first time and it was a success. 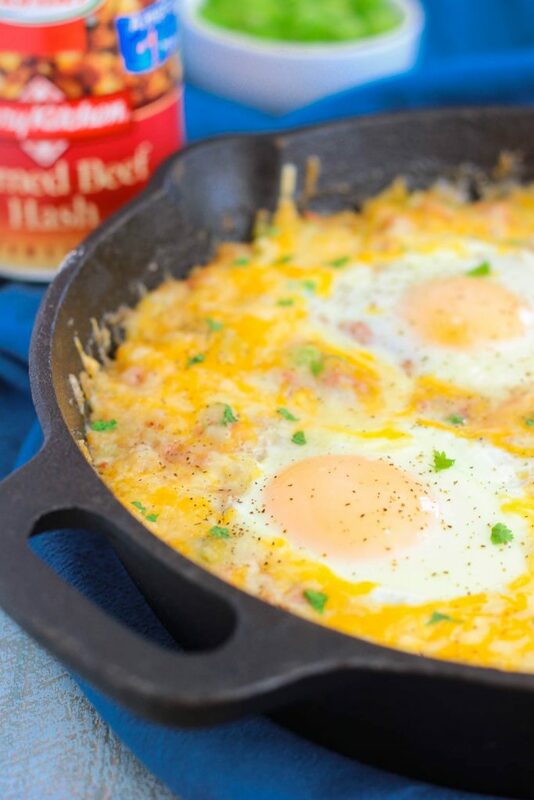 This easy corned beef hash sounds awesome for breakfast, lunch or dinner :) Looks perfect with those gorgeous eggs! Thanks for the corned beef love, Kelly! This is an absolute favorite of my husband's! 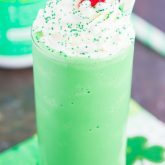 He usually makes it - but I just might have to surprise him with your recipe! Love the hash with the eggs on top! Thanks, Annie! I love the eggs on top, too...adds the perfect touch! I'm ashamed to admit I've never had corned beef hash before. Probably because I don't eat heavy for breakfast. I could totally see myself enjoy this dish for dinner though! Definitely going to give this a try!! Looks so good, I wis I had it for breakfast/lunch right now! 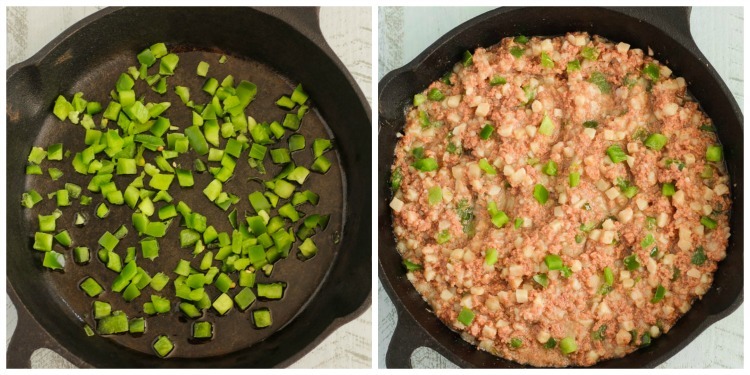 I've never made corned beef hash, but it sounds pretty easy! Pinned! Thanks for the kind words and pin, Mira! Oh this does sound good with beans! I hope you love this if you try it, Beverly! I've only had corned beef hash a few times before. . but this looks amazing!!!!!! love it with the eggs! what a fantastic looking breakfast! I've never tried to make "real" corned beef -- but this can of hash is DEFINITELY my speed! 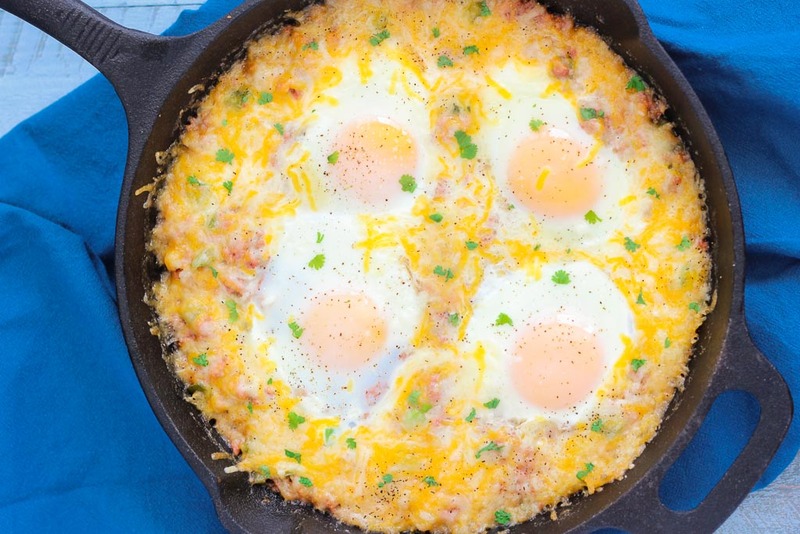 :) Love shortcuts like this, and the addition of the eggs in the skillet is making my mouth water! Such a great brunch for the weekend! Thanks for the hash love, Blair! Ah yes, I just plop the corned beef into the slow cooker too -- I can imagine how long it must've taken to trim all that fat off! I love corned beef but surprisingly I've never made a hash with it. This looks like a great savory breakfast or dinner! YUM!! This looks amazing! What a great brekkie/ brunch! I used to eat hash and eggs when I was little!! such great memories!! I've never actually made corned beef before but my husband always asks for it on st pattys day! And I always fail to deliver haha whoops! This sounds delicious with the hash and eggs! This is such a great breakfast shortcut! And believe me, my breakfasts need all the help they can get! I don't think I've ever had corned beef hash. How is that possible? This looks great. And I love the presentation in the skillet with the eggs. Very pretty. I love corned beef especially for St. Patrick's Day! It's so easy to make in the Crock-Pot, I probably would have tried to trim the fat off mine like you did your first time if it wouldn't have been for my sister helping me since she has made it so many times. 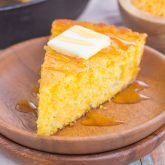 This recipe looks so delicious, I love breakfast food! Pinning it! Corned beef is a must for St. Patrick's Day! Thanks for the kind words and pin, Katie! love recipes which can double up as breakfast or dinner! looks like the perfect way to start your day! Thanks, Manali! This meal is definitely perfect for any meal of the day! This looks so good for breakfast or brinner! I've never actually tried corned beef, but I think I need to have this hash! Yum! Thanks, Aimee! It makes a delicious breakfast or dinner! HA!! I have never seen corned beef out f of a can before! Does this mean I have been living under a rock? lol That being said, those eggs look BOMB! Haha this was my first time trying it, and I have to say that I'm hooked! :) Thanks, GiGi! Thank you, Mary! 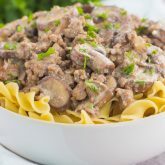 It's such an easy and flavorful dish! i have to cover mine, it pops out all over when cooking. im going to try with the eggs/cheese next time,hope it does not mess up the oven.it sure looks good in your piciures. I'm so sorry you had trouble with this, Warren! Mine did not come out when cooking at all. Best of luck to you and thanks for stopping by! I have made "quiche" with corned beef hash and an egg crisped in the oven a bit for the crust. It is really yummy!! Thank you for sharing, Jeanne! I will have to try that, sounds delicious! As we all know, as time goes by, most products become inferior to what they once were. These days, canned hash is more potato than corned beef and more fat than potato. From my childhood into my 30's, I always made my hash with diced fresh onions, O'Brien style frozen potatoes and canned corned beef. Over medium heat, fry the onions until they just start to brown, add the potatoes, mix well and continue frying and mixing until they start to brown. Then remove the corned beef from the can, break it up into the pan and continue frying until the hash starts to get crisp spots. Reduce the heat and crack eggs into little wells in the hash. Cover and cook until eggs are poached the way you like them. I like set whites and runny yolks. Ever since the canned corned became has become so high in fat by volume, I only make hash when I have leftover corned beef. Good news! We're having corned beef tonight. so it'll be hash and eggs within a few days. Thank you for stopping by and for sharing, Lorraine! Ahh that could be! :) Sounds delicious, though!